There is a certain amount of risk to writing about the near-future. Do the events, setting and technologies ring true? Could society have gone down the paths to get to that point in time? Are there still enough familiar elements to allow the reader to bridge the gap in time in his or her mind? In case my introduction wasn’t enough of a hint, let me be clear, 88 is a near future, dystopian science fiction novel. Set in the ravaged world of 2034, 88 is the story of a technology that has been horribly corrupted. The human mind has been established as being the most effective computing device in existence. Technology has been developed to allow the human mind to be scanned into hardware. Once in hardware, the scanned personality is virtually immortal, able to control and process the technology it is connected to. Truly revolutionary. The downside is, the invasive scanning process leaves the original brain a scrambled, vegetative mass. In other words, a person can only exist in one state – flesh or virtual. The power of the human brain is such that there is huge demand for scanned brains. The demand far outstrips the supply. That, as you might guess, leads to the growth of an underground market of scanned brains. And that is really where the story lies. Griffin Dickinson is an agent of the North American Trade Union (NATU) whose job is to find the sources of the black market scans. As the story unfolds, he learns of the depth and evil of the underworld organizations as well as the far reaching corruption that traffick scanned human minds. The setting is understandably dark – for a dystopian story like this to work it has to be. The world is in crisis, polluted beyond belief. Corporations wield immense power and the phrase ‘Corporate Warfare’ has become more literal than ever. The technology is, as one would expect, more advanced than our own. Air travel has advanced to where sub-orbital flights are the norm. The NATUnet is invasive and core to our everyday lives. The characters, both flesh and virtual, are human and relatable. Michael Fletcher does a great job allowing the readers to get into the heads of the characters. You actually get a sense of what it means to be a scan, something I wasn’t expecting. The gritty realism comes at a price – my thoughts and dreams were plagued by scenes from the book. If this is our future, I truly hope that there are oasis for my generation to retire to. Still, I couldn’t put the book down. I cared about the protagonists. I felt empathy for the scans and I loathed the unbridled selfishness and evil of the villains. The story ends at an appropriate point leaving many plot threads dangling. Was it a satisfying ending? Hardly, but a book of this nature, one that deals in the darkness of a corrupted future could hardly be expected to. Would I read it again or recommend it to others? Absolutely! In fact, I hope for a sequel one day. Maybe not today; my emotions are still a bit raw from the experience, but soon. 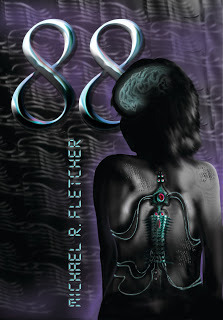 88 is written by Michael R. Fletcher and published by 5 Rivers [Publishing].